Greetings! I would like to welcome everyone to the Art of Ninzuwu blog page. If this is your first time visiting us, please take this opportunity to review some of our previous articles. We wish you the best in all your endeavors. Have a blessed day! Our next guest is a very ambitious woman whose work in the community has sent her reputation halfway across the globe. One of her goals is to help the Western world understand the genius of ancient Chinese culture, while serving as a catalyst for its own preservation. Recently, I was blessed with the chance to meet her acquaintance and gain some perspective about a culture that is still hidden, but has been a large influence in the history of humanity. Professor Qinling Wang shares a breath of China with us. Warlock Asylum: It is truly an honor to have an opportunity to hear some of your insights today. I was quite impressed when I heard about your work in the field of education. However, for some of our readers who may not be familiar with your person, how would you describe yourself and your work? Qinling Wang: I am an English teacher, but I am very interested in Chinese culture at the same time. Therefore, my interest focuses on the contrast between English and Chinese, not only from the aspect of language, but also from the aspect of culture. Warlock Asylum: What inspired you to pursue a career in education? What challenges did you have to overcome in order to make this dream possible? Qinling Wang: My grandfather was a teacher in an old-fashioned school and he was very knowledgeable. As a child, he told me and my other siblings, a lot of interesting stories. I admired him very much, and was inspired to be a knowledgeable person just like him. I grew up in the rural area of the North China. During this time, the people there placed more importance on boys instead of girls, especially in education. I was very lucky that my father gave me a lot of support. I insisted on going to college. My father was my steadfast supporter, both spiritually and financially. I am very grateful for what my father did, supporting me as a college student in a rural area was really a heavy burden for an ordinary family. I studied hard and fulfilled my dream to be a college student and then a postgraduate and a doctoral student. Warlock Asylum: Today, we find many people who claim affiliation with a specific culture, but are not aware of its history, or legacy. In your case, however, you have done much work to the contrary, and have embraced a deep understanding of China’s cultural legacy. What prompted you to delve deeper into Chinese history? What aspects of Chinese history, or Asian culture in general do you find most intriguing? Qinling Wang: I got my bachelor’s degree and master’s degree in the English Studies. My interest in English began during middle school. However, I was also very interested in Chinese at the same time. When I got my master’s degree in English Linguistics and Literature, I continued my pursuit of a doctorate degree in the Chinese Philology and Literature at Fudan University in Shanghai. I learned a lot about Chinese philology. In July 2007, I went to the Center for East Asia and Pacific Study in University of Illinois at Urbana and Champion as a visiting scholar from Freeman Fellow. When I began to communicate with people in the area, I realized that American people are very interested in Chinese culture. But I could not give them very detailed explanation about Chinese culture at that time because I hadn’t read much about it. I returned to China to teach at my university in June 2008. During the spring of 2009, one of my college leaders asked me, and other young teachers, to give some more optional courses to our English majors. Chinese Culture was one of the courses. I selected this course with hesitation. Earlier, the Chinese Culture course was given in Chinese. I decided to teach the course in English, as a great benefit to my students. This course would not only be good for their English understanding, but also aid their translation ability. Starting in 2009, I began to teach Chinese Culture. Most of the sophomores signed up for the class. They showed great enthusiasm in the course and I benefited from teaching the subject often. Now I can talk a lot about Chinese culture, since I have read many books and articles about it. Chinese culture is a very broad and insightful subject. I really enjoy it and will continue to perfect my knowledge of it. Culture is the root of a nation and the identity of a person, which I realized after living abroad. Warlock Asylum: China has such a vast history and its influence is felt globally. I must say that in just about every continent around the world exists the presence of someone of Chinese descent. Even in my own culture of Ninzuwu, we find that a good portion of it is based on the Yi Jing, which originated with Fu Hsi. Before we discuss China’s historical legacy within China, can you please share with us some of the things that Chinese culture has contributed to the world? Qinling Wang: Chinese culture is the origin of Oriental culture, and has contributed a lot to the world. There are many things that China has given the world, to list some of them: paper, compass, powder, silk, and tea. Other major gifts of the ancient Chinese inventors are an object for counting, called an abacus; the unique method of treatment called acupuncture; the first rudder; the first planetarium; the first water powered blast furnace, and etc. When referring to Yi Jing, the German philosopher and mathematician, Leibniz, benefited a lot from it, which led to his formation of binary arithmetic. There are too many things that Chinese culture has contributed to the whole world to list in this interview. Warlock Asylum: People respect China for its traditional sciences of acupuncture, herbal medicine, martial arts, and the unique path of Taoism. However, we find that much of this culture originated in what some scholars call Shenism, or Chinese Folk Religion. Can you give us a little overview of the impact that folk religion had upon Chinese culture and how widespread are its practices today? Qinling Wang: I have read some books about Chinese Folk Religion and I find this spiritual paradigm very interesting. 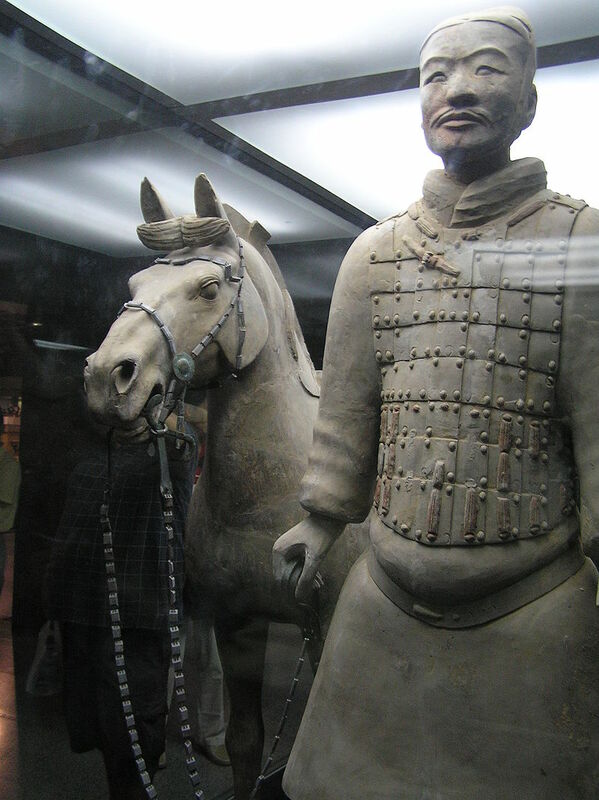 Actually, I think Chinese Folk Religion is connected to many historical figures; generals such as Yue Fei, warriors like Guan Yu; even individuals who have helped other people such as Mazu, a lady living in the Song Dynasty. 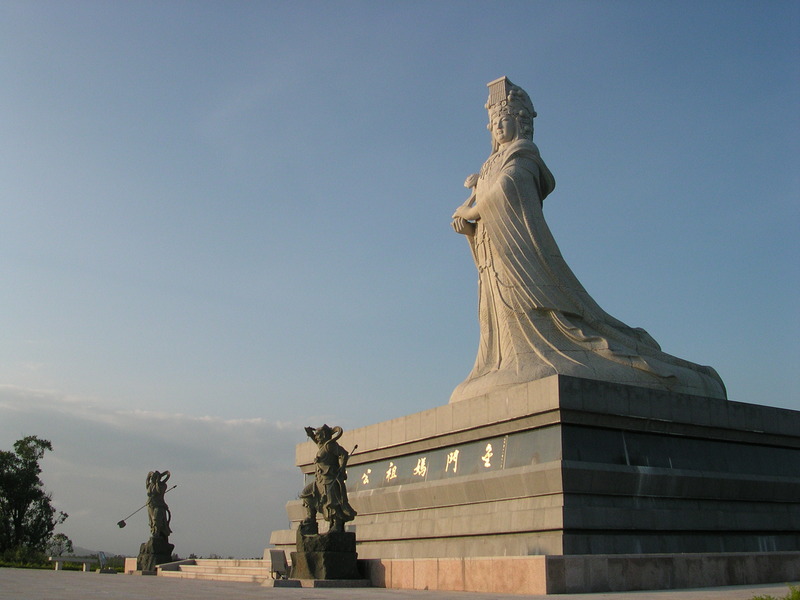 Mazu was a great humanitarian. After she died, people regarded her as a goddess. During this time, some certain deities in Buddhism also became gods and goddesses in Chinese Folk Religion, such as Guanyin, the Goddess of Mercy. Originally, in the Tang Dynasty, Guanyin was a male figure. Over time Guanyin was transformed into female figure, very graceful and elegant. Some people believe that this transformation was the result of changes occurring in society, as there were a lot of housewives in China that converted to Buddhism during this time. Some westerners believe that Chinese people don’t have religion at all. I think they are wrong. Actually, we Chinese believe in a lot of gods and goddesses. Besides the popular figures found in Buddhism, we also believe in a lot of personas existing in Daoism, our native religion, and in Confucianism, such as Confucius himself. The images found in Daoism are usually related to longevity. The images found in Confucianism relate to fame and rank. Therefore, in my opinion, Chinese people have plenty of beliefs originating from folk religion. We even believe in the mountain god and goddess, the river god and goddess. When a tree is very, very old, we believe that there must be a god or goddess living in it. We will then regard this tree as sacred. In our house, we have kitchen god and his wife as images of safely protecting the whole family. In our New Year celebration, we will offer sacrifice to them. We believe in heaven and the existence of a supreme deity that resides there.. See how colorful and interesting the Chinese Folk Religion is! You may not believe this, but we also have bed gods, restroom gods, and gods for every profession! Warlock Asylum: One of the things that grew out of Chinese Folk Religion, and its shamanistic aspect, is Taoism. The wisdom and practices of Taoism, speaking in a philosophical and religious context, is truly amazing. Based on your study and research, in what ways did Taoism affect ancient China? Do you think that the essence of the Tao was lost when Buddhism entered the country? Qinling Wang:Taoism, or Daoism, is China’s native religion. In China, we usually say, RU, DAO, SHI, which means Confucianism, Daoism, and Buddhism. Confucianism is placed first, then Daoism, and finally Buddhism. Chinese people uphold Confucianism, since this school of thought encourages people to be responsible in society. When people’s dreams are not realized, they will turn to Daoism for comfort. Daoism is a philosophy that promotes living longer, preserving health, having a peaceful mind, and harmonizing with nature. When people cannot find fulfillment in society, they will go to the mountain or the temple to find a peace of mind. It is a complementary of Confucianism, especially for the Chinese scholars in the past or at the present. When Buddhism entered China, Daoism benefited a lot from it. It enriched the teachings of Daoism. These two religions learned a lot from each other. Daoism didn’t lose itself. On the contrary, it became stronger and more powerful ever since it assimilated a lot of nutrients from Buddhism. Warlock Asylum: Recently, I was doing some research and came across this excerpt regarding female shamans, popularly known as the Wu in ancient China: “During the late Zhou Dynasty (1045-256 BCE) wu was used to specify “female shaman; sorceress” as opposed to xi 覡 “male shaman; sorcerer” (which first appears in the 4th century BCE Guoyu).” When I reflect on some of the ancient mythologies and the history behind some of its goddesses, such as Xiwangmu, Nuwa, or even Mazu, it seems that women had a prominent role in early Chinese society. How has the role of women in China change from its earliest times ancient to modern times in Chinese society, if it has at all? Qinling Wang: Women play an important role in China now, not only in society, but also in the family. Generally speaking, wives enjoy a prominent status in every household. Chinese women are really liberated. They earn their own money and have their own say in the family. Usually, husbands will have to treat their wives very well, since some women earn more money than men. In China, women will not change their fathers’ surname and adopt their husbands’, which is still popular in the American society. Women in China have more say than women in Japan. I often read that some Japanese husbands will beat their wives and not return home after work and will go to the pubs to drink liquor or wine. In China, usually, the women will be in charge of the finances. Husbands will give his paycheck to his wife. It is for these reasons that I believe that women in China are living better before. On the other hand, they live a harder life than before because they have to work to earn money and take care of the kid at the same time. Warlock Asylum: Generally speaking, many people living in the West are of the opinion that an Asian woman, even more specifically, a Chinese woman doesn’t have a voice in society. Her only value is that of a homemaker. How far is this sort of thinking from the truth? Based on your own personal experience, how does a Chinese woman view the world and her place in society? Does she feel liberated? Qinling Wang: This sort of thinking is very far from the truth. In Chinese society, there are more and more women who are becoming leaders in their respective communities. One of my department leaders is a woman and our university’s highest leader is also a woman. Women are more liberated than ever in the history of China. For most of the women, however, family is still the priority, especially when it comes the education of children. The situation is complex. Woman are liberated and have more say in the family and society. On the other hand, we have to shoulder the dual burden of family and work. When I lived in the United States, I met a lot of women who work and just stayed home to take care of their families. I really hope that Chinese women can have such a life, so they can have more time to take care of the younger generation. Today we have to work, and ask our parents to take care of our children. It causes a lot of problems in the natural education of the child. It is a very perplexing situation that Chinese women have to face. We are liberated, but we have to burden the outcome of this kind of liberation. This is the real situation of the women in China, especially the working women. Actually, almost every woman in China is working. Warlock Asylum: Since working in the educational field, I am sure that you have met many people who are unfamiliar with Chinese culture. Is it difficult translating some of China’s traditional values to students of foreign origin? If so, how were you able to overcome this barrier? Qinling Wang: Yes, you are right. In all honesty, I discovered that a lot of foreigners are interested in Chinese culture, but know very little about it. Some things you can’t make clear to foreigners because they don’t have the understanding of our culture. This is a very gradual process. We can overcome this kind barrier by respectfully communicating with the people from different cultural backgrounds. Every culture has its own shining points for people to enjoy and benefit from. Some of my American friends understand Chinese culture more because of their openness to such dialogue. I am very happy about this. Warlock Asylum: China’s relationship with the West has gone through its ups and downs over the years. I am currently working on an article about the Pacific Slave Trade, where nearly one million Chinese were shipped to the Caribbean and South America as slaves. This is just one of many injustices that the Chinese have suffered. For the most part, however, China continues to pursue relations with other nations in a diplomatic manner. How have people of Chinese descent been able to overcome some of the prejudice that they have faced over the years? Qinling Wang: Communicating is the best way to understand each other, not only for individuals, but countries. As far as the prejudices concerned, I believe it was due to China’s underdevelopment at that time. Now China is becoming more powerful. Chinese people living in distant lands enjoy more respect. In China, we have a saying that the overseas Chinese are just the daughters of our country. When China was poor, the overseas Chinese were looked down upon by others. When China is powerful and rich, they are treated better. Therefore, the overseas Chinese pay great attention to China’s development, since their destiny is closely connected with the fate of China. At the same time, the overseas Chinese also have contributed a lot to China’s development. When China is the World’s Number One no one will mistreat overseas Chinese at all. Warlock Asylum: China has become one of Nigeria’s strongest allies, if not its closest. This alliance has been quite profitable for both nations involved. It seems that people of Chinese and African descent has had this intimate and not so intimate relationship for centuries. I am reminded of the legend of Kunlun Nu, though the main character is a Negrito. Do you feel that due to the similarities in culture that people of African and Chinese descent are now starting to build a stronger relationship between each other? Qinling Wang: China and Africa belong to the third world, and both of them have suffered a lot from the imperialist invasions and exploitations. A friend in need is a friend indeed. So now they are brothers in developing themselves and they can benefit a lot from each other. China has contributed a lot to African people’s welfare. Perhaps this is why African people love China. Chinese philosophy of Confucianism plays a great role in shaping Chinese people’s behavior. Confucianism teaches us how to make true friends with others. I believe African see Chinese people as their real friends and they are willing to do business with us Chinese. Warlock Asylum: What advice would you give to people of Ninzuwu culture, or anyone who is seeking to learn about Chinese history? Where should they begin? Are there any specific books that you would suggest to read? Perhaps the Chinese classics? Qinling Wang: When you want to learn more about Chinese culture and our history, visit China and see the real of our culture; for example, the Forbidden City, the Summer Palace, the Great Wall in Beijing, the Terra-Cotta Warriors in Xi’an, and etc. It is more important to try our different cuisines. One of my American friends related an experience to me of someone he knows, who refuses to go back to America as he enjoys life in China so much. I will not recommend any specific book, since there are so many books about Chinese culture. If you find one that interests you, pick it up and read it. You will find more books to read. The most important thing is to begin with a book about Chinese. Warlock Asylum: What can we expect to hear from Qinling Wang in the future? Qinling Wang: I am compiling a textbook about Chinese culture for my sophomore English majors. Hope it will come out earlier and my students will enjoy it. Warlock Asylum: On behalf of the Art of Ninzuwu blog page I would like to express our deepest thanks for taking the time to answer a few questions and share some of your wisdom with us. Do you have any final thoughts? Qinling Wang: Every culture is unique. Hope every culture will have someone to protect it and develop it. *I would once again like to thank Qinling Wang once again for sharing some of her insights with us. We wish her all the best in years to come. Your work in the community is very much appreciated and has aided others in their evolution of consciousness.